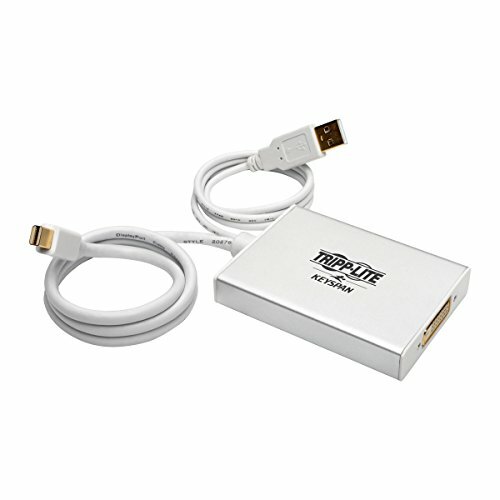 SEND HIGH-DEFINITION MINI DISPLAYPORT VIDEO SIGNALS TO A DVI DISPLAY: Connects Mini DisplayPort computer to DVI-D dual-link monitor, projector or TV. Active adapter for use with any Mini Displayport (or Thunderbolt 1 & 2) port. VIBRANT, SUPERIOR VIDEO QUALITY: Supports DVI dual-link video resolutions up to 2560 x 1600. Supports DVI single-link video resolutions up to 1920 x 1080 (1080p). Supports 24-bit Deep Color (8 bits per channel). Converts Multi-Mode (DP++) and Single-Mode DisplayPort output. SUPERIOR MATERIALS FOR SUPERIOR PERFORMANCE: Gold-plated connectors and contacts for excellent conductivity. Integral strain relief for long life. PLUG AND PLAY: Plug-and-play-no software, drivers or power supply necessary. Fits easily into briefcase, backpack or laptop bag.